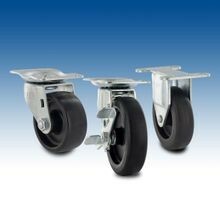 These heavy-duty casters are available in 2in tread widths. 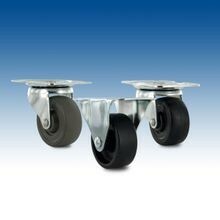 The wider wheels offer low profile casters with higher load ratings for customers who are looking strong casters that offer less visibility. The DF Series casters are maintenance free and provide load ratings from 110lbs to 350lbs per caster depending on the size. 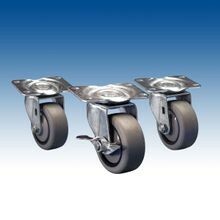 These soft caster wheels are available as swivel and have a side brake option as well. Outwater stocks these functional casters in both of our New Jersey and Arizona facilities. This allows us to provide customers with faster and more cost-effective delivery and shipping. The DF Series industrial caster are available with top plate. If you cannot find the caster that fits your needs, contact our friendly sales department to learn about other caster options. The Import Series Industrial casters have load ratings of 80lbs to 150lbs per caster depending on the size of the caster. Swivel and rigid options are also available in this line of casters and Outwater stocks the Import Series casters in both our Arizona and New Jersey facilities. This enables us to provide faster and more cost-effective shipping and delivery for all of our customers. This series of industrial casters is available with top plate mounting, and swivel and rigid options are also available with caster wheels with brakes if needed. if needed. Outwater’s extensive collection of heavy-duty casters is available to all of our customers and, if you cannot find the caster that fits your needs, contact our friendly sales department for information on other caster options. 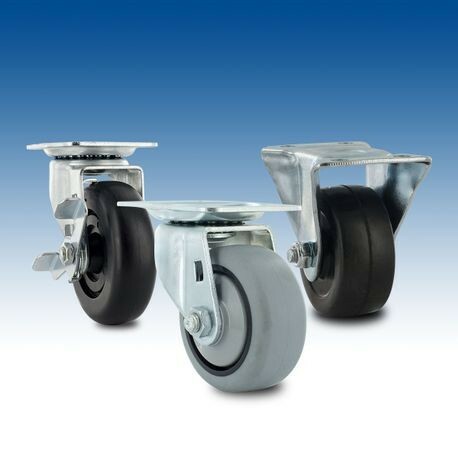 This reliable series of spring-loaded casters provides load ratings of 90lbs to 350lbs depending on the style of caster and are available in multiple tread widths available as well. We offer our Faultless Series as swivel or rigid casters and Outwater stocks the 100 Series industrial metal wheels casters in both our Arizona and New Jersey facilities, enabling us to provide faster and more cost-effective shipping and delivery for all of our customers. The 100 Series industrial casters are available with top plate mounting and, if you cannot find the caster that fits your needs, contact our friendly sales department for information on other caster options. These industrial black caster wheels also feature two independent rows of hardened, polished ball bearing raceways that are self-lubricating. This extends the lifetime of the wheels and lowers the cost of maintenance. 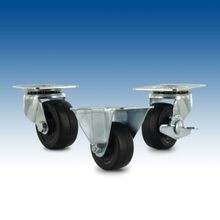 Our casters feature load ratings of 180lbs to 300lbs per caster depending on your preference. These stylish wheels also offer a corrosion resistant zinc finish. All of Outwater’s heavy duty caster wheels are stocked in New Jersey and Arizona to provide faster and more cost-effective shipping for our customers. The 400 Series industrial casters are available with a top plate mounting and are available to all of Outwater’s customers. This series of casters has a brake option available and if you cannot find the caster that fits your needs, contact our friendly sales department for information on other caster options. 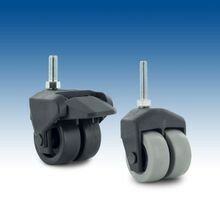 The low profile/business machine casters are available in two different wheel types. The Polyflex wheels are lightweight, cost effective, and nonmarring. This adds additional floor protection to the caster. The Polyflex wheels are also resistant to water and chemical absorption, and will stand up to repeated steam cleanings as well. 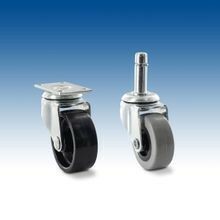 The second type of wheel in this series of casters is the glass filled nylon wheel. This wheel offers high impact strength and is nonmarring which adds the additional floor protection like the Polyflex wheels. 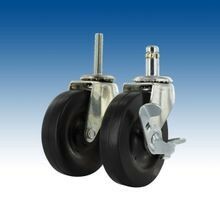 These casters are available in 2” and 3” diameters. The small diameters and low profile wheels are paired with high load ratings of 300lbs-500lbs per casters which makes these casters very easy to hide under high end electronics and furniture. These low profile caster wheels are finished in a black oxide with a corrosion resistant zinc top plate and are stocked in swivel style. These low profile, heavy-duty casters are very stylish and offer great rollability on low profile carpets and hard surface floors such as hardwood and tile. All of Outwater’s industrial casters are stocked in New Jersey and Arizona to provide faster and more cost-effective shipping for our customers. The low profile/business machine industrial casters are available with a top plate mounting and this series of casters has a thumb screw brake option available if needed. If you cannot find the caster that fits your needs, contact our friendly sales department to learn about other caster options. 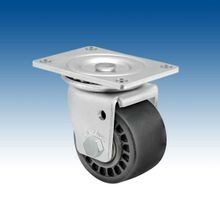 The single wheel casters offered by Outwater are best used for light duty applications and are available with a brake option if needed. 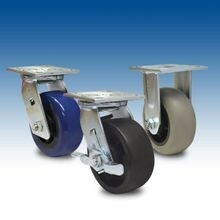 These casters feature a swivel movement and are stocked in both Arizona and New Jersey for our customer’s convenience. The single wheel series industrial casters are available for all of Outwater’s customers, and if you cannot find the caster that fits your needs, contact our friendly sales department to learn about other caster options. In the ball down position these heavy-duty casters also feature omni-directional movement and can be securely mounted to multiple surfaces which makes them a fantastic choice for almost any environment where full mobility is needed. Outwater stocks the ball transfers with flange in both Arizona and New Jersey facilities in order to provide faster and more cost-effective shipping and delivery for all of our customers. If you cannot find the stud mount ball transfer caster to meet your needs, contact our knowledgeable sales staff for information on other caster options. 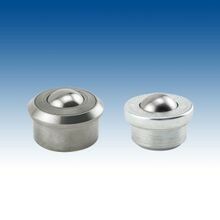 Our ball bearing casters can be used in either the ball up or ball down position and, in the ball down position, feature omni-directional movement. 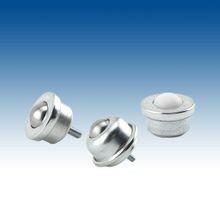 These roller caster wheels are easily installed and have a range of popular thread sizes available. Special order brake options are also available if needed. Outwater stocks the ball transfers with thread in our Arizona and New Jersey facilities in order to provide faster and more cost-effective shipping and delivery for all customers. If you cannot find the caster that meets your needs, contact our friendly sales department for information on other caster options. 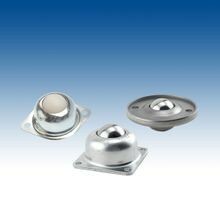 When used in the ball down position these ball transfers feature omni-directional movement, and if you cannot find the caster to meet your needs please contact our knowledgeable sales department for other caster options.